Cavities can destroy the structure of your teeth, cause pain, and ultimately lead to serious concerns such as an abscess or tooth loss. In addition, without treatment, infection can spread to the gums and jawbone. Using advanced technology, Dr. Michael J. Bixby and his team can diagnose and provide early, effective cavity treatment at their Red Bank, NJ, practice. When we eat, carbohydrates and refined sugars coat our teeth. The bacteria that naturally accumulates on tooth surfaces will react with these substances, resulting in acid that can damage our teeth. As tooth enamel becomes damaged, bacteria can reach more of the sensitive parts of the tooth, leading to decay that is known as dental caries, or cavities. For very minor cavities we are often able to provide effective treatment using fluoride and other specialized products to reverse damage without the need for a restoration. Mild and moderate cavities, however, will often require the removal of damaged tissue, leaving an empty space that needs repair. Our office provides tooth-colored composite resin fillings to restore the structural integrity of teeth that have been treated for cavities. This advanced material will be matched to the color of your tooth, and can last up to several years. More extensive damage may require a larger restoration to fully restore your tooth. An inlay is able to repair the chewing surfaces of teeth, often after a pit or fissure cavity. An onlay is similar to an inlay, but is larger and can replace one or more cusps of the tooth, as well as extend down the side of a tooth. Inlays and onlays will be made of quality tooth-colored materials, and can last for decades. If decay has spread within your tooth, the internal dental pulp may become infected. This damage will be treated using gentle, effective root canal therapy. Teeth that have been treated through root canal therapy will require a crown to fully repair the structure of the tooth, and provide protection from future infection. Dr. Bixby is dedicated to providing the best aesthetics in dentistry, and provides high-quality, porcelain crowns. These restorations will cover your entire tooth, match the shade of your smile, and maintain your natural bite. With advanced technology, our team can identify potential trouble spots earlier, and effectively treat cavities before extensive damage can occur. During a dental exam, we will take digital x-rays. This innovative technology involves minimal radiation compared to traditional film x-rays, and allows our team to identify potential trouble spots earlier, and effectively treat cavities before extensive damage can occur. We also use the DIAGNOdent laser to scan teeth. This advanced instrument gathers vital information about the location and depth of cavities. 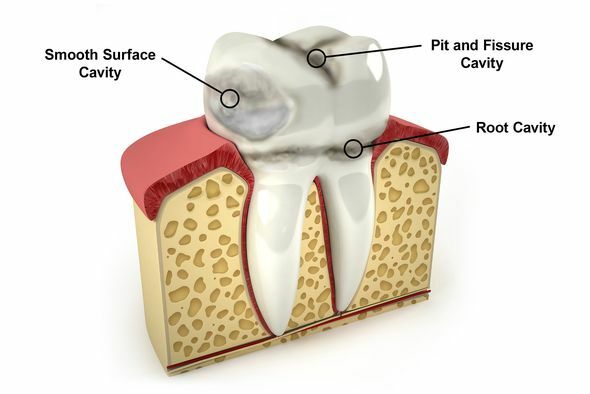 We commonly find areas of softened enamel before decay has occurred, allowing us to provide surface treatment to strengthen and restore your tooth before a cavity develops. Once cavities have developed, however, Dr. Bixby can provide gentle, effective treatment. He often uses an advanced air abrasion system to remove decay. Because the system does not generate any heat, pressure, or vibration, you may experience a lower need for anesthesia and sedation. Delaying cavity treatment can put your oral health at risk. Contact our office today to schedule a consultation. In our office, you will experience advanced, high-tech cavity treatment and excellent patient care.